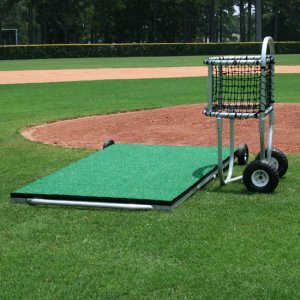 Our low profile mound saves wear and tear on playing surface in front of mound for batting practice. Extremely durable with an all welded aluminum frame. Saves wear and tear on playing surface in front of mound for batting practice. Constructed from all welded aluminum frame and outdoor plywood top covered with 5mm spike-resistant turf. 8 solid rubber wheels and handle for easy transport. Ball cart sold separately.